Cats and construction don’t really get along very well. After you’ve chosen your paint color, decided on what new carpet you’re getting, chosen your new kitchen cupboards……you also have to think about keeping your cat safe and sane during these renovations. Knowing how your cat reacts to stress is a key factor in deciding if you should keep him at home during the work or board him with friends or in a kennel. 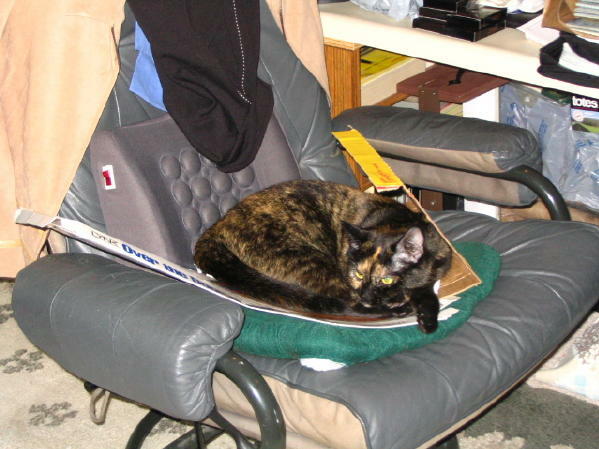 Keeping your cat at home is preferable to boarding him elsewhere. Cats don’t do terribly well when you take them out of their own environment. The situation can be challenging but you can prepare for cats and construction and the disruptions a few weeks in advance by finding a place in the house away from where the work will be done and gradually accustoming your cat to staying in that area for short periods. 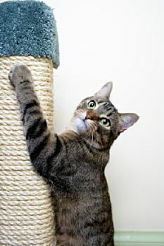 Playing a radio or television in the room can help adapt the cat to noise and can act as a buffer when the actual hammering and drilling occur. Cats and construction equals stress for both you and your cat. Signs that an owner can watch for during remodeling that may indicate that the cat is highly stressed include inappropriate elimination outside the litter box, acting more aggressive, not responding to stimuli the way he normally would, hiding and running away, and not eating. The most dangerous of these signs is if the cat stops eating. If a cat doesn’t eat for more than a day it can develop a dangerous condition called “fatty liver condition”. This is especially common in overweight cats who stop eating. In this case, take your cat to the vet right away. An owner can also ask the vet for an anti-anxiety medication if the cat is extremely stressed. Cats and construction stresses have some owners give their cats calming herbs like flower essences as alternatives to drugs to relax their cats. For some of the holistic calming products see my page called Pet Products. With cats and construction a primary concern is making sure workers who are entering the house close doors behind them so indoor cats won’t escape and also keeping cats away from sharp objects and tools. Due to their curious natures cats love to snoop into things and play in the sawdust as well as chase cords attached to a drill when it moves….so you can protect your cat by keeping him in a closed room when potential dangers exist in the work area. I have found that a bathroom, with an open window for ventilation, works very well. .
You can place their litter box, water, food and toys in the room along with a radio playing classical music. Be sure to place the litter well away from the water and food because cats don’t like to relieve themselves near food. If you have a towel cupboard in the room, leave the door ajar a little so your cat can hide if he feels the need to. Two major household dangers cats and construction face, particularly during a renovation, are poisoning and electrocution. Don’t allow your cat near fresh paint, varnish, or stains until the finishes have dried completely. Keep painting supplies in closed cabinets and dispose of used brushes, rags, stirring sticks, etc. If your cat does come in contact with paint or other finishes DO NOT use paint thinners or paint removers to clean him. Contact your vet immediately. However, I had an incident some years back when one of my cats got into paint and since it was latex, most of it washed off with a mild soap and water. The few areas that had dried too much for the paint to come off, I took a pair of scissors and simply cut it off. Better to have a cat with a few bald patches than one who poisons himself chewing the paint off. The fur grows back just fine. Cats and construction projects simply don't mix well. 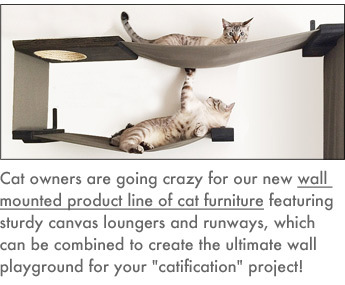 Something to consider is to check the VOC rating of the paint that will be used for your cats and construction project. VOC’s are volatile organic compounds or solvents that get released into the air as the paint dries. According to the U.S. Environmental Protection Agency, some VOC’s are suspected carcinogens. The federal government caps the VOC content in paint at 250 grams per liter (g/l) for flat finishes and 380 g/l for all other finishes (low-luster, semi-gloss, etc.). However, some manufacturers have opted to comply with more stringent limits…50 g/l for all finishes…set by California’s South Coast Air Quality Management District. These paints include such products as Benjamin Moore Aura, True Value Easy Care, and Glidden Evermore. A handful of paints whose manufacturers claim they contain zero VOC’s are now on the market. One is Mythic, which sells for $35-$45 a gallon at independent dealers nationwide. Another zero VOC paint is Freshaire Choice, a Home Depot exclusive that sells for $35 to $38 a gallon. Increased awareness of possible health risks to both humans and animals has led to a demand for products with lower VOC’s and manufacturers have therefore risen to the challenge, mainly by developing high-quality, latex-based coatings and adhesives for a wide variety of uses. Latex paints use water as their solvent and carrier, allowing both easier cleanup and generally lower toxicity than oil-based. Note: Price estimates given above are based on current prices at the time the article was written in May, 2012. Carpets are manufactured to be safe for humans and pets so the only potential hazard is any adhesive that is used. Most carpets are installed without much adhesive, but if any is used simply check that the VOC’s are low. A consideration with carpet is more along the thought process of what carpet will stand up to the pet accidents that can happen such as throwing up hairballs or a urine accident. In that case you need to avoid buying a looped Berber carpet and you need to buy a carpet that cleans easily. I would look at a short-napped, dense-pile, nylon BCF fiber, plush or textured plush carpet style. Your carpet should have an anti-stain treatment applied like Scotchgard or Stainmaster. A word of caution...carpet cleaners can have harmful chemicals so carefully check the label for safety information. And not every latex-based paint has low VOC’s…so read the label. Cats and construction aren’t compatible and some poisons that may be present during construction include coal-tar poisons in phenyl disinfectants such as Lysol and treated wood, tar paper and heavy oil. Lead paint used in homes built before 1978 is unsafe and particularly dangerous to pregnant women, children and pets. Health hazards can occur by inhaling air containing lead dust that was generated from simple activities such as sanding door frames, scraping exterior trim, replacing windows, cutting into drywall for room expansion, sanding wood floors or doing kitchen cabinet refinishing. Don't panic if you suspect your cat has been exposed to poison. Call your vet, an emergency veterinary clinic, your local poison control center or the National Animal Poison Control Center for instructions. Try to safely collect the material involved. If your cat is having seizures, losing consciousness, or having trouble breathing get him to your vet immediately. Be sure to take with you the products to which your cat was exposed. Also, bring along any material your cat may have vomited or chewed in a zip-lock bag. Cats and construction are not compatible so to prevent electrocution keep all electrical cords out of reach or covered by a chew-proof guard. Kittens, who will put anything into their mouths, are especially susceptible to electrocution from plugged-in appliances or live wires. If your cat should bite into an electric cord attached to a turned-on appliance or power tool, he may be electrocuted and die immediately. If he doesn’t die, he will most likely suffer fourth and fifth degree burns where the electricity contacts his gums and/or tongue. Prompt and extensive medical care is required to treat such burns to save the pet’s life. Should you find your cat in contact with an electrical wire, shut off the current and disconnect the plug before attempting to touch the cat or you may be shocked as well. If your cat is conscious and able to walk, call him to come to you and away from the source of electricity. If your cat is unconscious or awake but unable to move, use a non-metal object (such as a broom handle or a toilet plunger) to push your cat away from the electrical source. In this emergency, it may be necessary to call the power company and fire department as well as your veterinarian or emergency medical clinic. Some cats benefit from a little help. Often used when travelling or when storms are imminent...or the dreaded fireworks on some holidays...there are safe products that can help relieve the stress. During construction, also a stressful event in a cat's life, they can also help to lower the stress level.